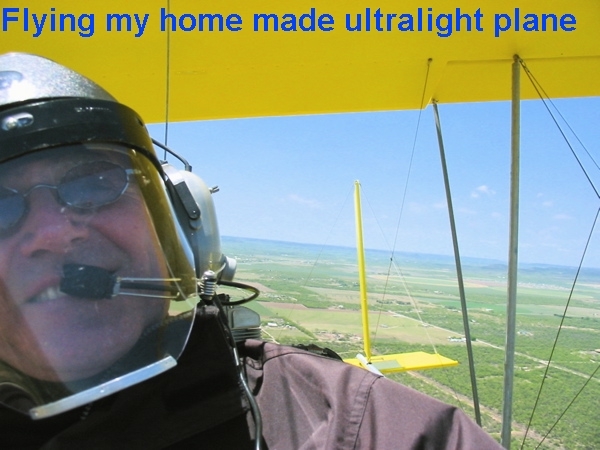 Mark Stull is an experienced ultralight pilot and ultralight constructor. 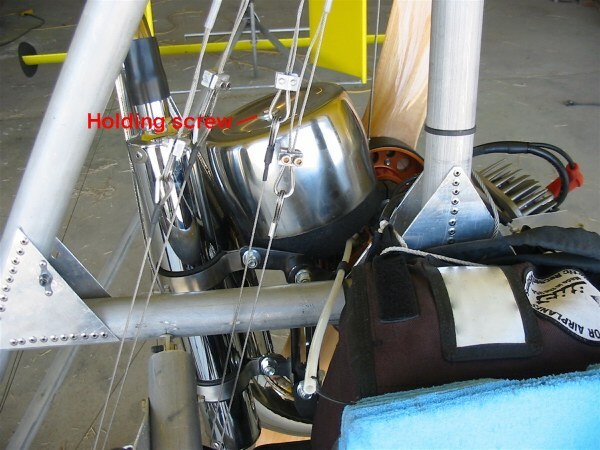 So far, using the Cors-Air M25Y?Black devil he built two ultralight airplanes that fly with great success. I'm sorry to report that Mark Stull died in 2011 on the first test flight of his last design. Mark was a prolific ultralight designer, usually building a new ultralight of his own design every winter, often reusing parts of the previous year's design. I think he was up to number 12 or so. All were extremely innovative; unfortunately the last one proved to be impossible to control. Mark was an active contributor on the homebuiltairplanes.com forums, always trying something new and reporting on it. I recall when he was working with the aerocorsair engine he bought from you. I never saw this modification though I had considered a somewhat similar modification to my own engine. This "invention" achieves a quiet intake, yet filters out fine dust. 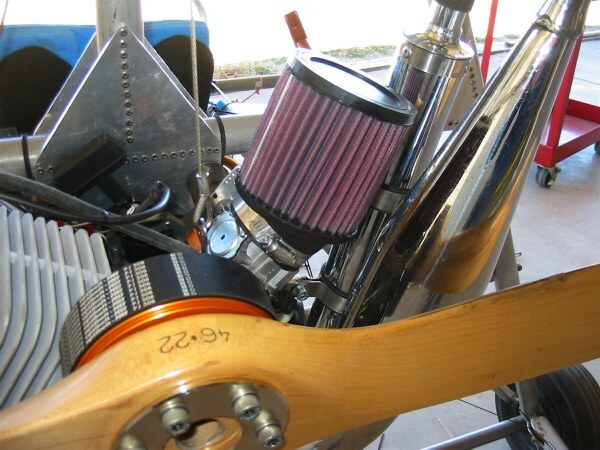 The K&N air filter fits onto the stock, red, velocity stack perfectly. This K&N #RU-1750 has a 20 degree bend neck, and is available from K&N's on-line store. Cut the excess length off the filter's neck to strengthen its mounting. Find a suitable canister to make the silencer. 6" diameter is about as large as will fit in the space. 5.4" is about as small as you could use, and still fit sound insulation inside, along with room for air to flow. It needs to have a flat bottom (which will end up on top), and be fairly light, so vibration doesn't break the air filter. I found this stainless steel "kitchen utensil holder" canister at WalMart. You could make your own canister out of fiberglass, using the bottom of a vinegar bottle for the mold. Use the bottom 4" of the canister. Cut off the excess with a cut off wheel or angle grinder, and clean up the edge with an angle grinder or file. I used 1/2" thick soundproofing sheet from Aircraft Spruce, part #09-42725, and glued it to the sides of the canister with Sticky Stuff Adhesive, part #09-27415, leaving more than 1" of the insulation extending below the canister. Do not glue insulation to the end of the canister where it touches the top of the air filter. There needs to be at least 1/2" of space, between the insulation and the filter, for air to flow freely. I found it necessary to mount the canister slightly off-center onto the filter to allow good clearance from the muffler. So check the fit before attaching the canister to the filter. Drill or punch a hole in the top of the air filter to mount the canister, being careful not to leave particles inside the filter that can be sucked into the engine. Attach the canister to the filter with one (AN-3) bolt or machine screw, with fender washers on both sides. Use Loctite on the bolt so the nut can't fall loose into the engine. Temporarily attach the filter (with canister assembly), and trim the soundproofing as needed. Also mark a location for attaching a safety wire between the canister and your airframe, so the canister can't fall off into the prop. Drill the hole for the safety wire, and mount the filter at a slight angle for better muffler clearance. The canister quiets the intake roar amazingly well.